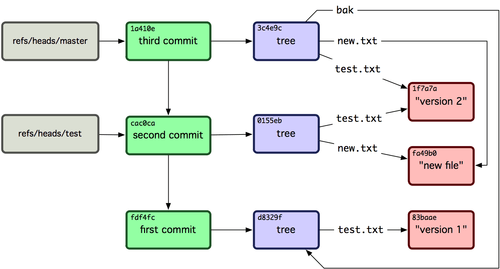 Now, your Git database conceptually looks something like Figure 9-4. Figure 9-4. Git directory objects with branch head references included. You’ve just gone over Git’s three main object types, but there is a fourth. The tag object is very much like a commit object — it contains a tagger, a date, a message, and a pointer. The main difference is that a tag object points to a commit rather than a tree. It’s like a branch reference, but it never moves — it always points to the same commit but gives it a friendlier name. in the Git source code repository. The Linux kernel repository also has a non-commit-pointing tag object — the first tag created points to the initial tree of the import of the source code. Remote references differ from branches (refs/heads references) mainly in that they can’t be checked out. Git moves them around as bookmarks to the last known state of where those branches were on those servers.